Bend low beneath the prayer flags as you enter the small dome. Your eyes adjust to the dim light as the bright sun outside gives way to the soft colors of fabric and flickering candlelight. Music plays softly in the background as you join the others visiting the four shrines, a mandala of memorials. But this time the shrines are not to human individuals who have died but to entire species who have left this world. Welcome to Altars of Extinction. In the east is an altar to the Xerces Blue Butterfly, last seen in the early 1940s. The first North American butterfly known to have gone extinct at human hands, it lived in the coastal sand dunes of San Francisco. Why did the Xerces Blue go extinct? As in most extinctions, habitat loss was a primary cause. The coastal dunes of San Francisco had been heavily impacted by urban development. The last known colony of the Xerces Blue lived in an area that is now part of the Presidio. With the U.S. Army's expansion of the Presidio as part of the war effort in World War II, the last remaining members of the species were destroyed. East for the air, the power of flight, we honor the butterfly in the East. Moving sunwise around the circle, you come to the Raven's Manzanita in the South. This subspecies of the familiar manzanita is not yet extinct. A single individual plant remains, growing on a hillside overlooking the ocean in the San Francisco Presidio. Cuttings have been taken from the Raven's Manzanita, but just the one remains in the wild, unable to reproduce naturally without a mate. Biologists teach us that each species has a population threshold that it cannot drop below without being at grave risk for extinction. The Raven's Manzanita has long dipped below its threshold. The remaining plant thus stands at the border of existence and non-existence - a bridge between the worlds. It invites us to celebrate its unique existence even as we contemplate its imminent demise. South for fire, for green plants' miraculous ability to transform light into subtstance, we honor Raven's Manzanita in the South. We come now to the Thicktail Chub in the West, a minnow that inhabited the lowlands and weedy backwaters of the pristine Central Valley of aboriginal California. One of the most abundant fish in the area, it was a favored food of the Patwin, Pomo, and other native peoples. A primary cause of the thicktail chub's extinction was the conversion of much of the Central Valley to agricultural use. Its loss paralleled the destruction of healthy, meandering rivers, the flooding of millions of acres of wetlands, and the removal of large expanses of riparian vegetation and forests, all sacrificed to agribusiness. West for water, for the origins of all life in the oceans of the world, we honor the Thicktail Chub in the West. In the North, we honor the California Grizzly, once a powerful presence in the landscape of native California. The largest land animal of the region (frequently surpassing 1000 pounds), the grizzly roamed the foothills and valleys of central and coastal California from the Oregon border to near San Diego. Its habitat overlapped significantly with that of humans. This bear was a constant presence in the lives of the native peoples who inhabited these areas, considered by some to be the animal most similar to humans, capable of communicating with receptive individuals. The grizzly figured strongly in the stories, rituals, and healing practices of native peoples throughout California. We can now only imagine the impact on one's spirit of sharing the land with an intelligent, thousand-pound predator. The last California Grizzly died in the 1920's in Los Angeles County. Its loss leaves a void in our landscape and our hearts. North for the earth and the creatures of earth, for the deep silence of winter and the slow, still patience of a bear's heart, we honor the Grizzly in the North. "Altars of Extinction" is an artistic and ritual memorial which provides an opportunity to collectively contemplate and grieve the extinction of plant, animal, and fungal species at human hands. Why build altars to extinct species when so many are endangered and in dire need of protection? Reasons range from the highly practical - by learning about extinction, we are far better equipped to prevent further losses - to the deeply spiritual and philosophical. As author Mark Jerome Walters remarked, "Each extinction is a unique voice silenced in a universal conversation of which we ourselves are only one participant. When the tiny wings of the last Xerces blue butterfly ceased to flutter, our world grew quieter by a whisper and duller by a hue... Rarely, in turning our attention from a recently extinct species to our last-ditch effort to save another, do we pause to say goodbye." Through the creation of altar exhibits and permanent altars, the project seeks to break through our society's denial of the current mass extinction spasm, the sixth such extinction crisis in the Earth's history and the only one caused by a single species. Since the altars include local species that have recently been lost, they allow the global environmental crisis to become more personal and real. When the finality of extinction is fully absorbed, people are moved to a new level of engagement and action. The altars themselves have been created by various artists, with most altars honoring a single extinct species. 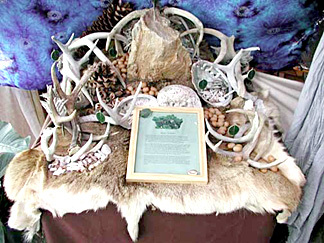 The altars include written descriptions about the species' habitat, behavior, and how it went extinct, and link the specific extinctions to global mass extinction. The exhibits provide areas for people to leave offerings, such as flowers, poems, or candles, and places for people to sit quietly with their responses to the altars. 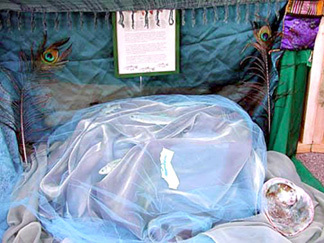 They also serve as settings for educational events, storytelling, rituals and ceremonies that invite participants to honor the species and collectively grieve their loss. Altars of Extinction also allows us to honor those who have passed from this world. Many spiritual traditions view death as a numinous moment, a sacred opportunity for spiritual practice. In many indigenous societies, the dead are revered as ancestors. Whether or not they are literal biological ancestors, those who have gone before us are honored as spiritual ancestors and included in ceremony as an integral part of the circle of life. 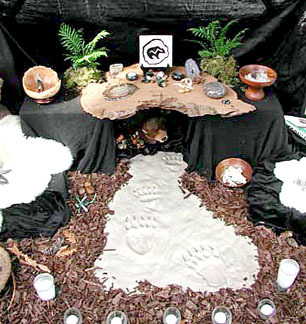 From a shamanic perspective, the altars are not only tributes to our more-than-human ancestors, but doors through which we can communicate with them. As such, they offer us an opportunity to seek guidance from the spirits of extinct species, especially regarding the current ecological crisis. It would seem that these ancestors in particular would have something to say about large-scale environmental issues. 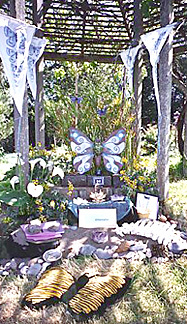 Since our founding in 2002, we have created altars at environmental conferences, events, festivals, and zoos, including the "Extinction Temple" described above (at the 2002 Bioneers Conference in San Rafael) and an extinction altar at Reclaiming's 2002 Spiral Dance. Thus far, our altars have honored the Xerces Blue Butterfly, Raven's Manzanita, Thicktail Chub, California Grizzly, Santa Barbara Song Sparow, El Segundo Flower-loving Fly, and Long-eared Kit Fox. We also created an altar paying homage to the many varieties of agricultural plants "discontinued" by corporate seed companies. But the circle is not yet complete. Turn to the Center, enter the unknown. A black curtain hangs from ceiling to floor. Take a rock from the basket outside the curtain and walk inside, where you find a dark well. 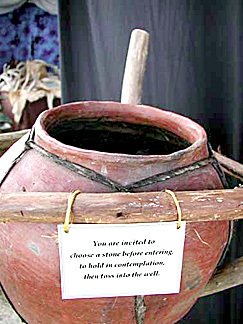 Look into the well. You can't see the bottom. Drop the rock in. Feel the weight of it leave your hand, and wait as it sinks slowly to the bottom of the dark pool. Feel the loss, the mystery. Another species gone, another form of life extinguished. Who has left this world already? So often, we don't know. Most extinctions go unwitnessed by humans, those we can name simply the edges of a great unraveling. So you come here with a humble and open heart, taking this moment to say goodbye. Mary E. Gomes is co-director of Altars of Extinction, and co-author, with Theodore Roszak and Allen Kanner, of Ecopsychology: Restoring the Earth, Healing the Mind. She teaches in the Psychology Department at Sonoma State University in Rohnert Park, CA. She would like to thank the Mesa Refuge for support during the writing of this essay. For more on the altars, visit www.shamanicscience.org. For more information or to help create an altar for the Altars of Extinction Project, please contact Mary Gomes or Allen Kanner at mary.g@earthlink.net.